I suspect that the sweaty hours I spent getting the edges trued up in order to glue up my workbench top are going to be something I look back fondly on as simple and relaxing. I pulled the clamps off the bench top and laid it on my wobbly pseudo-bench. And I started in with a scrub plane to level the top. Well, probably the bottom of the top in point of fact. I checked it with a straightedge, and it’s reasonably coplanar. For weathered, rough sawn, glue-splattered wood that is. A few knots were sticking up, so I knocked them down with the toothed blade in my Lie-Nielsen low angle jack. 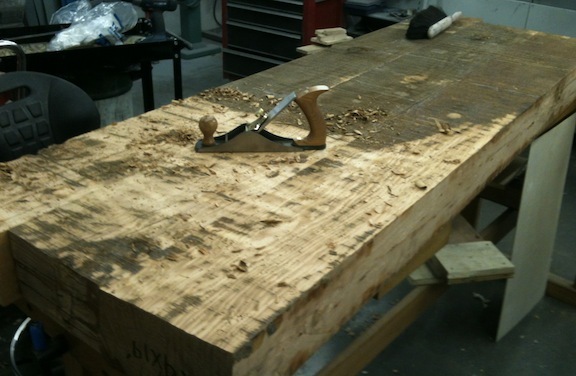 Then I started traversing with my scrub plane. As long as I don’t run into a knot with it, this goes really fast. 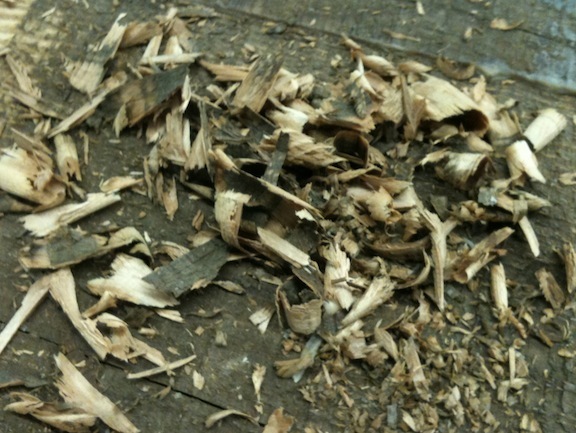 And I have to say, I don’t think chunky shavings get enough love. I expect I’ll be at this for a while. Still, I need to start looking for some 6″ x 6″ stock for the legs. Lookin’ good from here. As soon as I finish my tool cabinet (by next weekend), I’ll be full on the base of my bench (top is done). I some big ol’ wood that I’ll be workin’ into legs next week. Can’t wait to see how yours turns out.